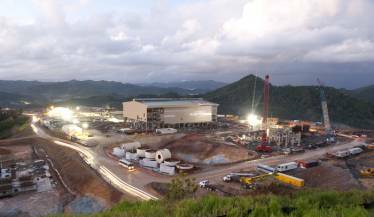 In April of 2009, Portland Bolt was approached to manufacture anchor rods for an ore-processing facility and gold mine in the Dominican Republic. The Pueblo Viejo mine is expected to extract and process 24,000 tons of ore per day. The $2.7 billion project will create 3,500 jobs and considerable increase to the local economy. During Phase 1, Portland Bolt delivered over 58,000 pounds of ASTM F1554 Grade 55 and 105 hot-dip galvanized anchor rods, with 52,000 pounds shipped in two weeks. To date we have provided almost 100,000 pounds of anchor bolts for this project. The assemblies ranged in diameters from 7/8″ to 2-1/2″ and included special packaging requirements to accommodate international shipping. The bolts were Charpy tested and many required welding. The customer needed quick delivery to meet their construction schedule. With our large steel inventory and in-house galvanizing, we were able to expedite production and deliver within the requested timeline.